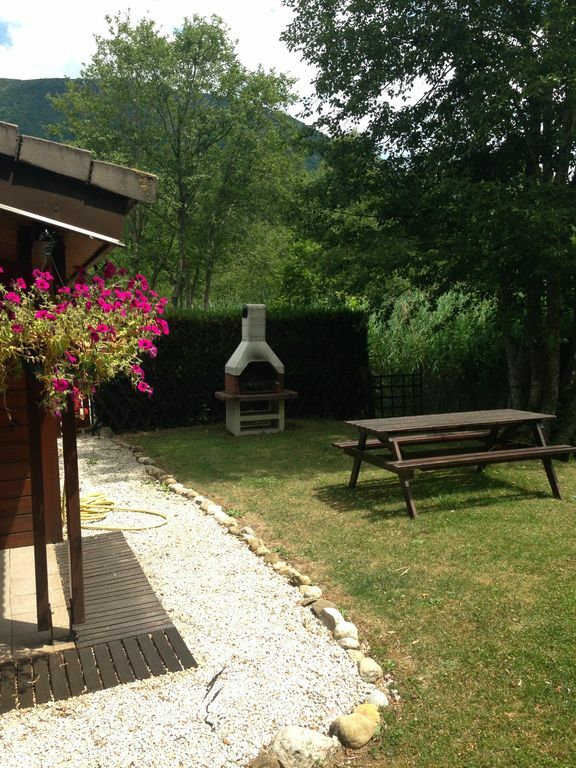 Beautiful wooden cabin on Lake Annecy situated in camping Nubliere. Its quiet spot makes it ideal for couples and also for families as the campsite has bouncy castles, play areas, a beach restaurant and kids club. It has a secluded and pretty garden. There are 2 bedrooms. One has a double bed and wardrobes and the other has bunk beds plus an extra pull out mattress under the bottom bunk. There are wardrobes for storage in this room also. There is a bathroom with a sink, cabin shower and washing machine. The WC is separate. The fully equipped kitchen consists of a 2 ring electric hob, fridge, small oven/grill, microwave, kettle, toaster, filter coffee machine and Nespresso machine. Outside there is an permanent charcoal BBQ. Parking available for one car. In the living area there is a sofa, dining table with seating for 4. TV with UK free to view, French TV, DVD and Playstation. Some games and DVDs are provided also There is a IPhone/IPod docking device with radio. On the front porch is a outdoor table and chairs and an additional drinks fridge. There is a picnic table in the garden also. There are games and beach toys available for your use. The cabin has duvets and both square and rectangle pillows. Guests are required to bring their own bed linen, towels, bath mat and tea towels. We operate a system which requires guests to clean before they leave the cabin. There are plenty of cleaning products available. We live about 1 hour from our cabin and visit regularly throughout the year to enjoy Annecy and the lake. The bathroom has a shower and sink with plenty of storage. There is also a washing machine.7 The WC is separate. One inside and one outside on the terrace. Duvets and both Square and Rectangle pillows are provided. Guests are required to bring their own bed linen, towels, bath mat and tea towels. Guests are required to clean the property on departure. The damage deposit will be withheld in the event the cabin is left unclean. A great place to holiday in lovely surroundings. On arrival we found everything was beautifully clean, and was just as described and looked homely and comfortable as well. The property is in a lovely corner of the site with a nice garden, which meant that we could sit comfortably in solitude when we wanted to. The owners had thought of everything that we needed, and the facilities on the site were very good. We would certainly recommend and we hope to come back again this year.